Never in my life have I been in a co-op. Until I lived in Lansing, I had never really been close to one. I never made it to the East Lansing Co-Op mostly because it was on the other side of town. We did check them out at the Lansing Market the few times we went there though. One of the things I really liked about Lansing was how close I was to a bulk spice store. I don’t cook with quality spices. I just cook with a lot of spices. I’m not a chef, so I don’t pretend that I need expensive, high-end spices. I just really like the taste of dried thyme in just about everything. Since moving to Kalamazoo, I’ve been looking for someplace similar, but with no luck. 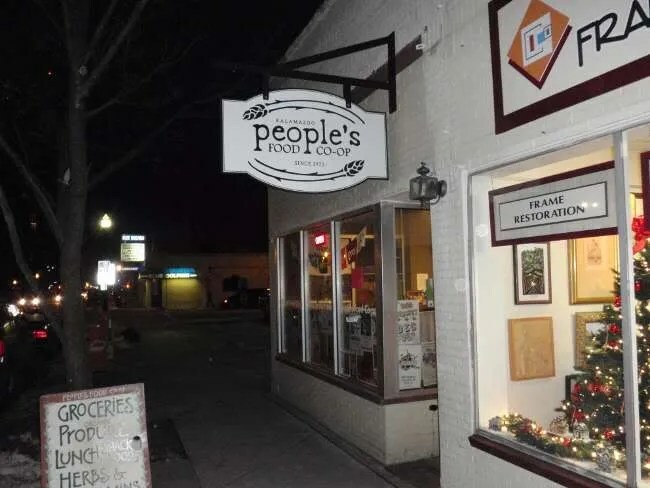 The one place I thought maybe I would be able to find bulk spices was the People’s Food Co-Op on South Burdick Street in downtown Kalamazoo. I headed downtown for no reason at all. I took Burdick Street all the way from Portage just to see what kind of businesses were along that corridor. 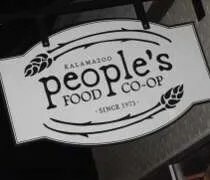 I wanted to snap a few pictures at night of the Kalamazoo Mall, so I parked, quite accidently, right in front of the People’s Food Co-Op. Since I was in the area, I decided to check it out. The Co-Op is open to the public, so you don’t have to be an owner to shop. The building is tiny. I mean really tiny. There is one shelf that runs from floor to ceiling right down the middle of the long, narrow building. The aisle on either side of this shelf is very narrow. It’s barely wide enough for two people to pass. I found the bulk spice section against the wall. There was another lady filling up some cups, so as I was looking, I had to try to stay out of her way. Unfortunately, it wasn’t quite what I was looking for. The spices come out of large plastic containers kind of like what you would find in a restaurant supply store. You pour them out and weigh them on a scale next to the display. The prices weren’t really what I was looking for either. Again, I’m not sure I’d save any money by doing it this way. That was thing with the place I went in Lansing. I could get a pound of dried spices for about six bucks. Since I never bought in quantities that large, I would walk out with quite a few bags of different spices that would last me several months and not spend more than five bucks. Because I felt a little claustrophobic, I headed out of the store after that. What I learned is, Co-Op’s aren’t really my thing. That’s not to say they’re a bad thing, just not my thing. I’m more concerned about the cost of food not the sustainability or organic growing methods. In a perfect world, I would be able to find a balance between the two, but currently, and in my current financial state, cost effectiveness is going to outweigh most other things. They’re going to expand soon and move to a new location once they get a bit more equity. I do like the employees there which are quite helpful and know their stuff, and some products like their organic cider are quite delicious. But based on your style, I’m not surprised it wasn’t your thing. I don’t mean that as a slam. It’s just a personal preference. I’m not there yet. I’m at the point where I take reusable shopping bags to the grocery store, but I still buy a case of bottled water, so I’m cancelling myself out. I only talked to one employee very briefly, but it was a good conversation. They seemed to know everyone else in the store and for such a small store, there were quite a few people there…..that’s a good sign. Where’s the bulk spice store in Lansing? Like I mentioned in the post…it’s not so much a quality place, but it’s a place to buy cheap spices. There’s a spice store on Westnedge near Milham. It’s on the east side of the road, just north of Walgreen’s. You may find the flavors you seek there! For cheaper spices, you might try International Gourmet Pantry. It’s at 1514 W. Michigan Ave, near WMU campus right by Waldo’s and Bruno’s Pizza. Cool. I’ll check that out. Never heard of that place before.